On Thursday, October 20th I made the decision to sell 23 shares of my 69.069 share position in Walgreens Boots Alliance (WBA). I sold the 23 shares for $80.9352 per share which netted me $1,853.51 after commission and fees. Nope that's not a typo, that's a 123.38% return from Walgreens Boots Alliance. What's really impressive to me is that 21.18% compound annual growth rate AND these returns don't include the dividends received which just boosts the return even higher. After trimming my position by ~1/3 I know own just 46.069 shares of Walgreens Boots Alliance. The returns are a bit murkier when looking at my entire position in Walgreens Boots Alliance. 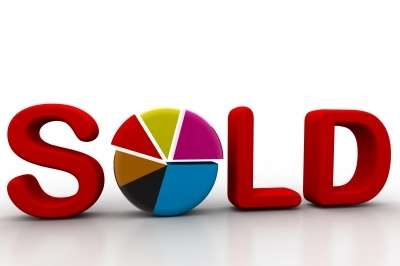 There's been 2 purchases, 5 reinvested dividends, 12 cash dividend payments and now a sale. To figure out how the position as a whole stacks up we can calculate an internal rate of return. My entire position in Walgreens Boots Alliance has performed admirably generating over a 25% internal rate of return. So yeah I'm pretty happy with the results thus far. You might be wondering why I would sell shares of a company that's done well for me. Well, sometimes I ask myself that same question. Walgreens Boots Alliance is a Dividend Champion with 40 consecutive years of dividend growth that's given me a raise every year that I've owned it. In fact the total organic dividend growth since I first purchased shares has been over 36% although the most recent increase was just 4.1%. That's all well and good but there were a few reasons that I decided to sell. For one, the share price appreciation has far outpaced the dividend growth pushing the current yield down to just 1.84%. I also want to be a bit more cash heavy than normal to take advantage of really good opportunities if they present themselves. Plus cash allows me to be more active in the options market where it should be very easy to generate more income via options premium than the dividend yield from Walgreens Boots Alliance. The valuation on Walgreens Boots Alliance isn't completely out of whack which made this a harder decision. Walgreens Boots Alliance reported 4Q and fiscal year earnings this past week and the GAAP EPS were $3.82 although the adjusted EPS were $4.59. That puts the TTM P/E ratio at 21.4x to 17.8x. They also provided guidance of $4.85 to $5.20 of adjusted 2017 EPS so shares are currently trading at a 15.7x-16.8x forward multiple. I've changed my tune a bit from the buy and hold and just focus on the dividend from earlier in my dividend growth investing "career" although that still remains the core of my investment philosophy. However, at this stage of the game with nearly $200k in my taxable accounts I also understand the value of taking profits every now and then. There's plenty of stories of investors getting out of companies to lock in a gain only to see the company continue on doing wonderful things and compounding wealth at absurd rates. While I still think the Walgreens Boots Alliance business model should do well over time I felt it was time to reap some of the rewards from the investment I sowed a little over 4 years ago. So I trimmed my position by around 1/3 at an absolutely wonderful return. Since Walgreens Boots Alliance is a Dividend Champion and I just sold some shares I unfortunately no longer get to receive payments on those shares. My forward 12-month dividends were reduced by $34.50 which in the bigger picture isn't that bad since I desire a larger cash position. However, since the dividend yield was relatively low at just 1.84% that should be an easy hurdle to boost my cash flow via the options market or through an outright purchase of a company. Just for some perspective an investment offering a 3.68% yield would double my annual cash flow. Do you own Walgreens Boots Alliance? Have you taken profits on an investment to make sure you lock in some gains or do you just let it ride? 21% CAGR is a really good return on investment. Congrats on booking those profits -- it's never an easy decision to sell your winners. It was definitely a decision I didn't take lightly but I think you have to take profits every now and then. Especially when they're excellent returns. Since savings/cash flow is light right now I want to have a heavier cash position. When I was saving and able to invest $4-6k per month I wanted to be near 100% invested since there was plenty of extra investable capital coming in each month so it was just a matter of waiting a couple weeks or a month to get more cash to find opportunities. Loved seeing that 21% CAGR although it could have been even better if I sold earlier when the share price was up near $95 over the last year. I contemplated it but there was so much going on I admittedly wasn't paying as much attention to the portfolio. Never held WBA in my account nor do I have plans to. I'm not a fan of retail in general. Buying is hard, selling is harder. That's a fact. 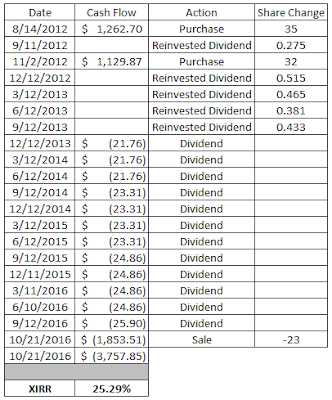 I have taken profits many times before I became a dividend growth investor. Buy low sell high was the game. Since I became a dividend investor I have not sold anything, yet. Of course, this down't mean I'll never sell. I do plan to sell if I do not like a company anymore or feel the money is better put to use in higher yielding stocks. Thanks for sharing. The primary business for WBA and CVS is pharmacy benefit management, essentially, the pharmacy business. The retail is more of an add on since they get lots of consistent traffic from people that are having to go in to pick up their medications. My general strategy is to buy/hold/monitor and hopefully never sell although I've definitely changed my thoughts on that a bit. Usually it's valuation related and I tried to close my General Mills position earlier this year above $70 but the limit order didn't trigger. However, the WBA trim was more just to take some cash off the table. I had a total of $2,392 of my own capital invested in the business and thanks to the price appreciation was able to extract $1,853 of that by only trimming my position by 1/3. In my book that's a win although much of this is triggered by the fact that we no longer have huge cash savings on a monthly basis. We went from have $4-8k on a monthly basis to a very tight income/expenses spread. Things will get better in the future, but it's definitely a lot tighter now.